American Settlement Funding (AmSett) understands that managing your finances can be a major challenge while you enjoy your holiday season. Through affordable and flexible solutions to your ever­ changing financial needs, AmSett can provide quick access to your future annuity installments when YOU need them. Though I had considerable savings in addition to my annuity, when it came to selecting the perfect house that I was looking for, it was just beyond my budget. I considered a wide range of options for meeting the deficit; however, in each case, I would have lost a substantial amount of time. After several days, every option for receiving the money I needed only put the purchase of my new home in jeopardy. Finally, one of my friends suggested that I call AmSett. I was hesitant in the beginning; however, after much deliberation, I realized that I couldn’t afford to not entertain all scenarios in getting the cash I needed as soon as possible. Mark, my representative from AmSett, walked me through the process of receiving the lump sum payment needed as a down payment for my dream house. He was prompt in offering me multiple quotes so I could customize the transaction based on my current and future financial needs. He also guaranteed that I would receive the money within the desired time frame needed to close on the home. Thanks to Mark, I was not only able to receive the lump sum I needed to fulfill my primary requirement, but I also retained a significant portion of my annuity installments which will come in handy down the road. Mark also provided several cash advances to hold me over until my transaction was approved. 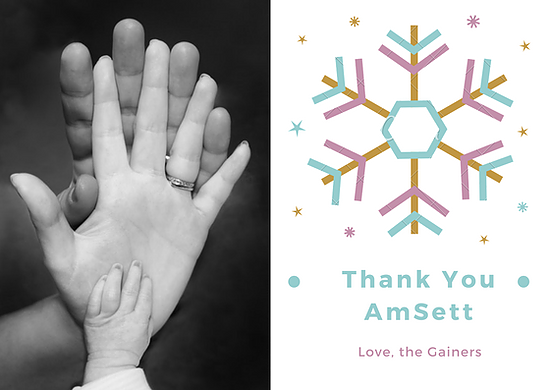 This holiday season would not have been the same if it were not for AmSett! Taking the next step and moving forward with this offer has changed my life! It helped me secure the house that I have been dreaming of forever with my wife. AmSett made my dream come true ­– to celebrate my first Christmas as a family in my own house. Everything from making the first call to AmSett to receiving the keys to our home has been a remarkable experience. It was more than just receiving the money at the right time; it was the outstanding customer service that helped me establish faith in AmSett. I highly advocate you to take your experience to AmSett. Thank you AmSett for being there to make my holiday the best!